Several of our recent projects have successfully incorporated leaderboards to engage teams, not just with the activity in front of them, but with a wider sense of connection and reward across the company. They can be added to many workplace learning situations, giving them a social feature that encourages participation and competition. Space Invaders (first released in 1978), is recognized as the first game to use a leaderboard, with many people encouraged to pay for another game just for a chance to see their three initials ranked in the top ten. Most games quickly followed suit and added this simple method to encourage repeat use. But gamification is now much more sophisticated and leaderboards are no longer just about a list of top scores comparing individuals. Although they can still be simple to view, behind the scenes they are more complicated and require thoughtful design to ensure success. Leaderboards can show achievement and ranking through points or badges. These can be made easy to provide quick rewards and incentives to continue. Or, points and badges can be made harder to achieve based on a deeper level of commitment or knowledge. Which route is chosen needs to be considered carefully. If points or badges are too hard to win, people can give up and become isolated from the sense of team. Being really far down a leaderboard can overwhelm people, suggesting that a respectable position is out of their reach. But if points or rewards are too easy, people can disengage or feel patronised by the simplicity. Rewards and points need to be matched to the people involved and the purpose of the activity. Levels of difficulty need to be set for the majority of those involved, not just a few who might already be highly knowledgeable or a few that might be new beginners. The majority need to be able to succeed at a level that matches their ability to see worthwhile progression. Leaders need to feel proud and others need to feel inspired to rise to the challenge. The purpose of leaderboards is about motivation, collaboration and encouragement, not a way for the best performers to show off yet again or the lowest scorers to feel embarrassed. People have different motivations. Some of us like to collect points and badges and the more the better. It gives us a sense of pride and recognition. Others just like to win. We will strive to be the best and beat the rest. Whilst some of us prefer the social aspect of participating in a group, seeing what’s going on and who we can connect with or compare to – whether that is with our local colleagues or giving us a sense of connection to other global teams that we might otherwise not meet. Leaderboards can be designed to reward a range of motivations, otherwise they will be limited in their ability to engage. Points and badges can be designed to be earned and shown differently over time for different types of activities. And options to repeat activities can be kept open so that inclusion on a leaderboard is not a one-off experience. Badges don’t always have to be about gaining higher scores. They can be used to show a level of skill, a completed task, time commitment or area of interest in a visual manner. They can be displayed as part of individual or team profiles. Some badges can be harder to achieve and therefore carry more weight, others might be easier or are just to indicate preferences. 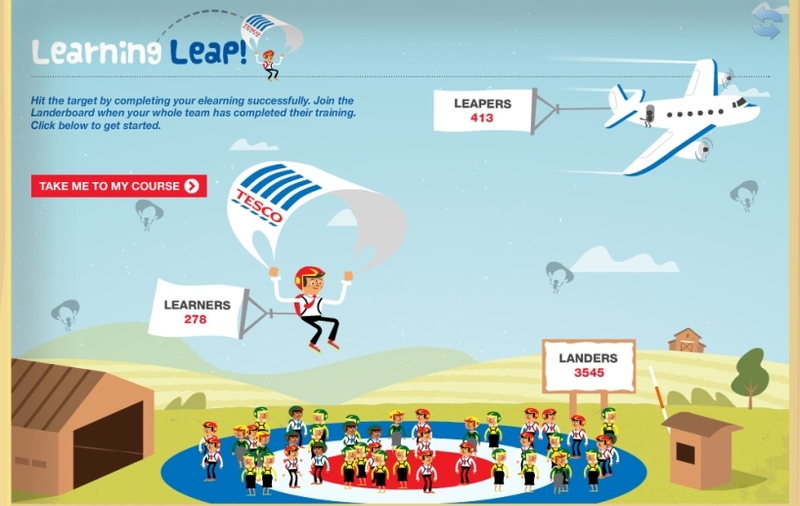 The Learning Leap leaderboard we created for Tesco charts learner progress. Keep it social. Keep them coming back. Notifying people of changes to leaderboard positions can be a very effective way to maintain the social interest. It can encourage people back to try again so they can regain a higher position. And ‘this week’s high score’, or ‘most improved team’ can create regular stages of interest and excitement above and beyond any final destination. Regular notifications don’t just have to be for the participants. Managers can get updated on their team’s progress – allowing them to offer further encouragement or congratulate them for what they have achieved. We’ve seen this result in unprecedented levels of involvement in some of our client companies. 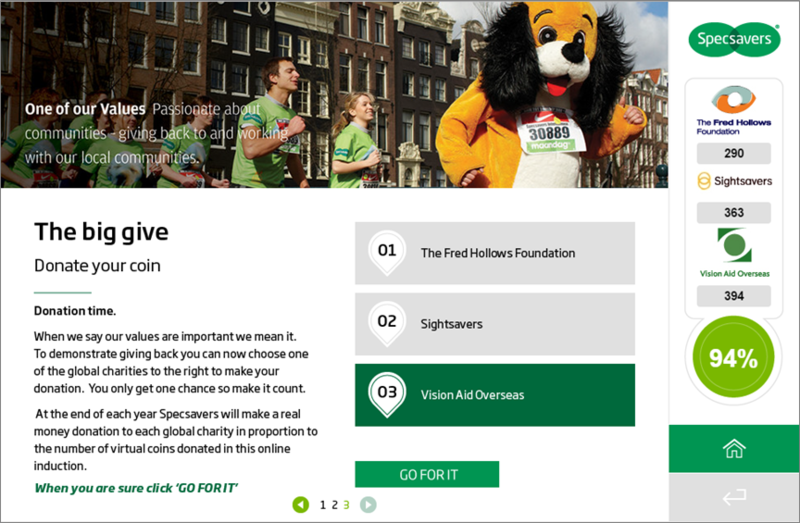 We used leaderboard technology to create a donation tally as part of an onboarding module for Specsavers. And whilst leaderboards can successfully reward sales teams, track performance or benchmark learners, we have also applied them successfully to CSR activities, where teams compete to increase a company’s charitable donations and embed community values. So whilst leaderboards do cater for those of us that like to be ranked amongst the high scorers, they can also be very effective at generating a sense of collective good and social action.